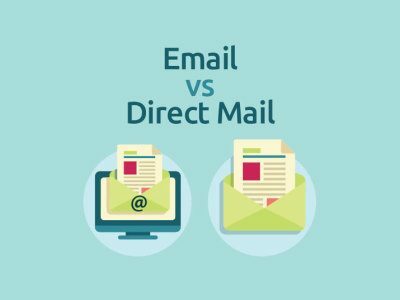 Both email and print marketing have advantages and disadvantages, but both are a cost-effective and efficient way to find potential customers, make sales, up-sell to the current customers and stay connected with all your existing customers. On top of this, both marketing methods can be easily implemented into marketing plans for not just large businesses, but small businesses too. Direct marketing is still a very powerful way of marketing, one of the advantages of this includes the ability to get your message into the hands of potential and existing customers. Many people in the world still don’t use email, but people will spend a lot more time reading a post card or a letter than they will with an email. Recipients can be entranced when they receive an envelope or post card through their letterbox. You would need to make sure that you design your marketing material to catch the recipients attention. Often, recipients will receive poorly marketed pieces of information which will be ignored. You would need to make sure that your printed design stands out from all the rest, this can be company colours, catchy tag lines and more. You need to make sure that you are targeting the right audience, if you’re not they you are wasting time and money. If you are sending marketing materials to the right addresses and the specific people, then this will help your costs to stay down and higher your chance at making a sale. Completing all the above takes time, thought and money. For smaller businesses, you would need to keep adding and improving your mail lists and marketing materials from day one. For many small businesses, home-based businesses and professional practices, this will determine how well your mail lists and marketing materials are. Email marketing is cheap, quick and easy to implement. Even though it has these attributes, it will not be replacing printing marketing anytime soon. One advantage that email marketing has is that it is trackable. You will be able to view data such as open rates, link clicks and other conversion details. This information can help you to improve future emails. Email lists are easy to start and you don’t have to spend anything on these. You would need to create a database of email addresses, but collecting email addresses further than your current customers can be challenging and time consuming. Eventually, your list will start to expand. You would also need an email service company to help manage and send out your emails, don’t worry as many services have a free plan to manage certain amounts of email addresses. Once everything is set up, your email can be sent out to the entire of your email list. This is done within minutes and your recipients would start to open these after a few minutes. You would even start to get a few hits on your website after. Links can be provided onto the emails, these links can be to anywhere on your website. Links help to get the point across about who you are and what products or services you provide. The speed of all this is one of the reasons why people enjoy receiving emails. What is best to do for smaller businesses? You need to remember that you can use either of the marketing methods, each business will see one method work over the other. Printed marketing may work for your company, email marketing may work for your company. Each of the methods have similarities and differences and you would need to decide which method, or even both, work for your business. Printed marketing and email marketing are a perfect match for each other as each method makes up for the disadvantages of the other. If they’re used side-by-side, this can create one powerful marketing plan. Information collected from Yahoo Aabaco Small Business! Check out their article here!